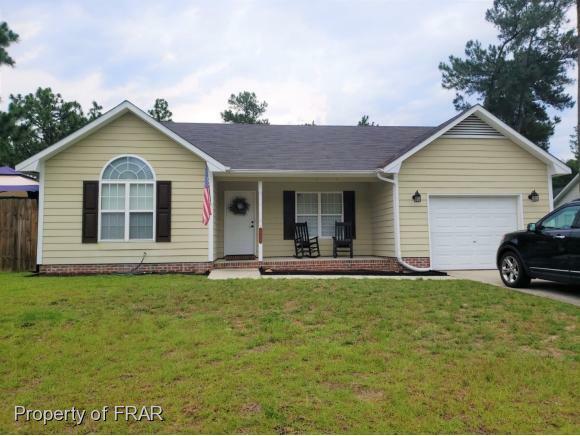 COME SEE THIS WELL-MAINTINED 3 BEDROOMS,2BATH HOME TODAY!CONVENIENT TO FORT BRAGG AND SHOPPING,THIS HOME FEATURES VAULTED CEILINGS IN LIVING ROOM,EAT IN KITCHEN,LARGE FULLY FENCED BACK YARD.A STORAGE SHED IN BACK YARD,ABOVE GROUND SWIMMING POOL,NEW PAINT THROUGHOUT AND MUCH MORE! Directions: Head West On Raeford Rd(R)onto Northwoods Dr(R)onto Raymond St, Your Destination Is On The Left. Inclusions: Refrigerator, Above Ground Pool Upon Buyer Request.